The paper paints a grim picture for the financial health of older Americans, suggesting the country may be sliding back to the days when the elderly were viewed as a burden and were forced to live their later lives in misery. Senior citizens are much less able to obtain employment than younger bankruptcy filers, both because of age discrimination and physical or medical limitations, the study authors observed. This makes them unable to recover their financial health after bankruptcy the way a younger person could. According to the paper, written by researchers from several universities, America’s senior citizens are increasingly in need of protection from creditors and filing for bankruptcy more common than ever for this population. Depending on their age, the rate of older people’s bankruptcies has increased between 200 and 300 percent in the last 30 years. The researchers note that historically, before Social Security was created under Franklin D. Roosevelt, older people in the United States were treated abysmally. The idea that families took care of their elders is a romantic myth, possible only for wealthier households. Seen as a tax liability, the elderly poor were either neglected or auctioned off for farm labor. The New Deal and post-war prosperity brought pensions and Social Security. Then Lyndon Johnson signed Medicare into law in 1965, and the attitudes and outlook for elderly Americans shifted from pauperism to comfort and security. This brief era of financial and physical well-being for the elderly continued through the 1980s and 1990s, but by 2006, older Americans were feeling the pressure of a society that was concerned with their cost to future generations. In the late 20th Century, the shift began to reverse, the researchers wrote. The country pushed the responsibility away from the government and corporations and onto families and individuals. The age at which full Social Security benefits are available has gone up since then, and pensions have been largely replaced by 401(k) plans that leave older people to their own devices, at the mercy of the stock market and their own investing abilities. Other research has shown that without guaranteed income streams — such as those provided by annuities — some seniors outlive their savings. Others become so fearful of running out of money that they don’t spend as much as they could. And while many experts say you can live comfortably on a percentage of what you spent during your pre-retirement years, at least one study suggests retired seniors can expect to spend substantially more. The end result for some has been confusion and the possibility of financial ruin. The change has brought more struggles among the elderly to keep financially solvent. The authors say that about 12.2 percent of annual household bankruptcy filings — about 97,600 — are from households headed by senior citizens. 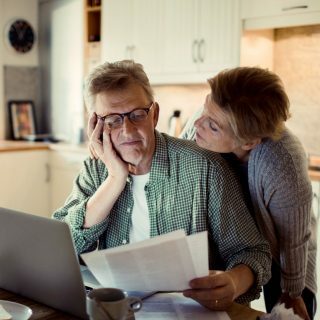 The most pressing causes of these filings, according to survey respondents, were inadequate retirement and employment income and medical expenses, in spite of Medicare. “Older Americans’ reported reasons for filing strongly suggest that they are experiencing the fallout from our current individualized risk society and the corresponding shrinkage of their social safety net,” the study authors wrote. Study author Deborah Thorne, of the Consumer Bankruptcy Project, told NPR, “The financial squeeze on older Americans has just gotten tighter and tighter and tighter as we have weakened the social safety net that they can depend on. And here’s the pickle for them, is that they’re older, so they cannot recover. They cannot go back to work at 65 and 70 years old and recover the money that they’ve lost. The study says the answer to this problem is for the country to shift its attitude and how it cares for seniors again.